The Quon driveline, featuring the clean GH11 engine with increased horsepower and torque and the "ESCOT-VI" automated manual transmission with enhanced fuel efficiency, is available for all models. The driveline uses advanced technology for high levels of fuel efficiency and smooth driving comfort with minimal fatigue. 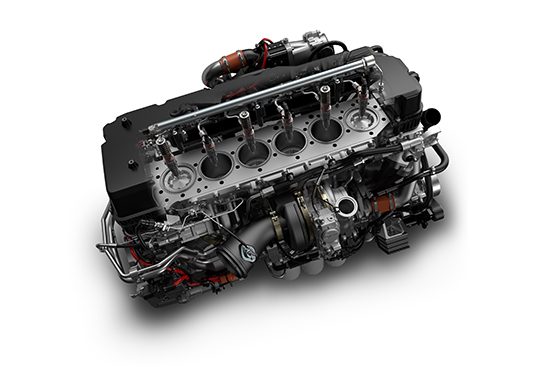 The GH11 engine’s new fuel injection system uses the unique properties of both unit injector and common rail system. 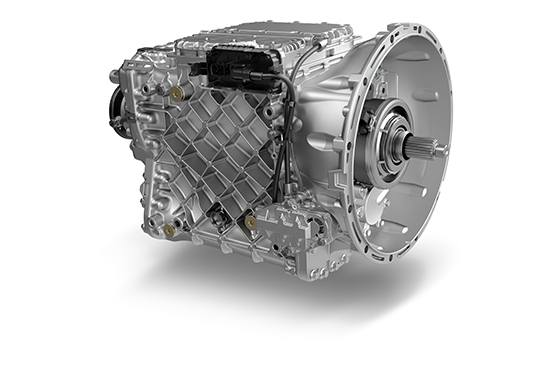 The ESCOT-Ⅵ 12-speed automated manual transmission suppresses fluctuations in fuel efficiency. Further evolution in hardware and software control has achieved enhanced fuel efficiency with quick response. The Foretrack road predictive function enhances fuel efficiency when the vehicle drives with high speed on the climbing up and down slope road. When using cruise control (at 60 km/h or more) in ECO mode, this function enhances fuel efficiency on hilly roads. Using GPS, road gradients are scanned and saved to predict road conditions when driving the same roads again. Automated optimal control of vehicle speed, engine rpm, and auxiliary braking ensure comfortable, safe, and eco operation regardless of driver skill. 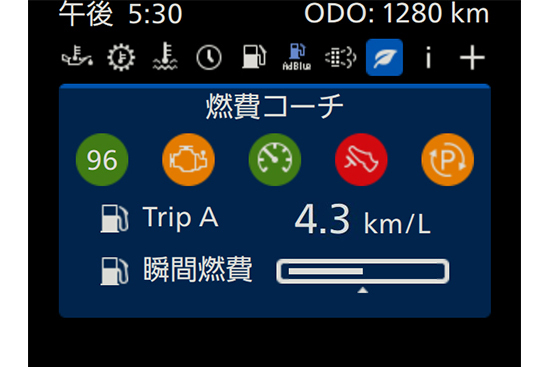 The "Nenpi Coach" system analyzes driving patterns for a specified time period, then displays optimal fuel-efficiency advice on the multi-display monitor in an easy-to-read format. The driver can also check other detailed info and optimal driving techniques to improve fuel economy. 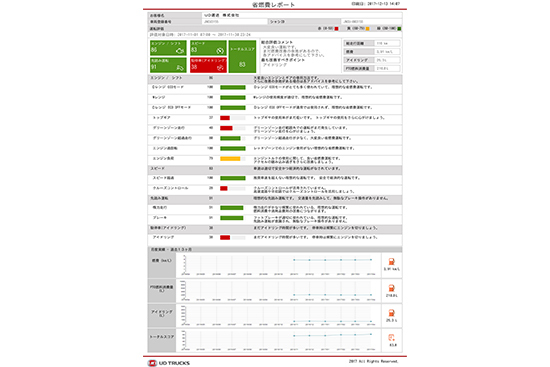 The UD Information Service receives fuel efficiency information that is calculated with the Nenpi Coach directly from the truck, and provides fuel efficiency results and driving evaluations on a monthly basis for each vehicle. With manual trucks, fuel efficiency largely depends on the skill of each driver. 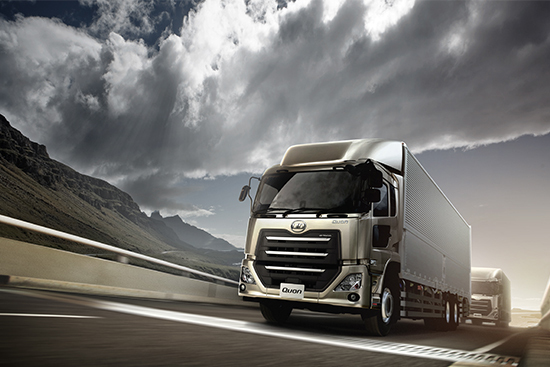 Most of our 800 trucks have manual gearboxes, so it is very difficult to improve our overall average fuel consumption. With an automatic truck as excellent as this new Quon, we expect to further improve fuel economy and reduce total cost. Also, I am interested in other merits of automated gearbox, particularly the ease of driving.